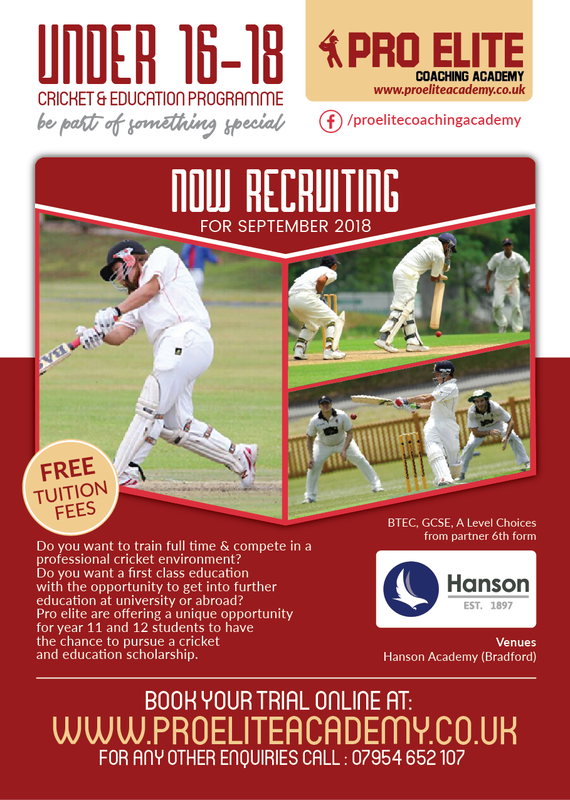 Pro Elite Academy is proud to announce that we are in a working partnership with Hanson Academy to deliver a BTEC in Sport and A Levels alongside a full time Cricket training and games programme. Hanson Academy has an excellent reputation in delivery high quality education to the young people of Bradford. The Cricket Academy programme has just began but Hanson Academy has an excellent history of success with 100% past rate in BTEC Sport. At Pro Elite we know that teaming up with Hanson Academy will produce an excellent learning environment for young Cricket stars, in the classroom and on the pitch. Structure of the educational programme. Cricket Academy students will work to tailored education programme, this allows for high quality training time and focused classroom studies. Students will study a Level 3 BTEC in Sport (Development, Coaching and Fitness) qualification, which is the equivalent to 2 A levels. 13 BTEC sport modules will be delivered in the 2 year programme. This will provide students with an opportunity to experience a variety of subjects in sport, from sports injuries to organising sports events and Anatomy and Physiology. BTEC Sport is coursework based with no final examination. The BTEC is an excellent, recognised route to apply to university and for scholarship application in the UK or USA and Canada. The school has an outstanding record in delivering BTEC qualifications with a 100% pass rate. We pride ourselves on the excellent relationship we have with or student’s parents/guardians. For more information or to register your interest, please fill in Scholarship details form, here.